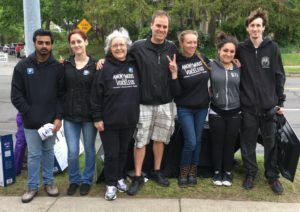 ARRoc members were on hand for the closing weekend at the Lilac Festival to remind passers-by what meat, dairy, and eggs involve behind the pretty packaging. Thank you to Carol H, David, Graham, Leanne, Mary, Robyn, and Varun for participating Saturday. They were there six hours in order to catch the attendees of a concert that night. Sixty-five people decided to take veganism seriously as a result of this demo, and if you’re keeping track, yes, that’s a new record. We came back Sunday, and thanks to members Carol H, Graham, Leanne, Mary, Nolan, Robyn, and Varun for putting in four more hours. Overall for the five Lilac Festival demonstrations, 216 passers-by decided to take veganism seriously. The next Cube of Truth is scheduled for Tuesday, May 30th 5-7 pm for a concert at the Blue Cross Arena. Please RSVP in case there are changes.